Ten years ago we were given the news that our firstborn son had Alobar Holoprosencephaly. As my husband and I sat in a dark ultrasound room, the doctor explained to us that our baby had no brain and would not survive. He scribbled the long diagnosis on a piece of paper, and told us to follow up with our regular OB. The days and weeks that followed are painful and a blur. We had so many questions—and no answers. We desperately needed support—and there was none. We needed someone to help us navigate this heart-breaking time—yet we were alone. Joseph was born on July 8, 2004. We got to hold our son for the short time he lived. And then we had to say goodbye. I cofounded Forever Footprints, formerly OC Walk to Remember, after Joseph’s death. 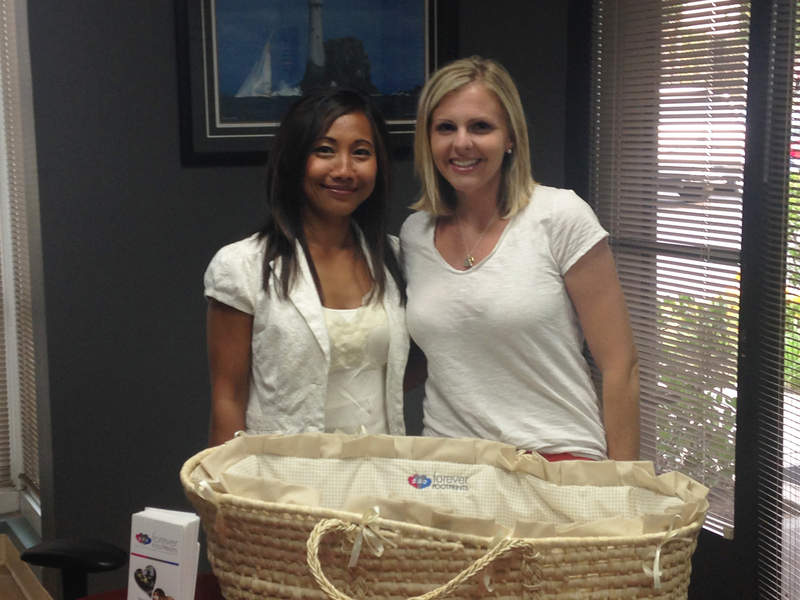 And there has been so much support given to families who have faced a pregnancy loss or infant death. But in the past ten years, I’ve also met many families like me who were given the news that their unborn baby had a life-threatening or life-limiting condition, and more support was needed. The Board of Directors of Forever Footprints committed to create support for families who receive such a diagnosis. It began with a meeting one year ago with UC Irvine Medical Center in Orange. 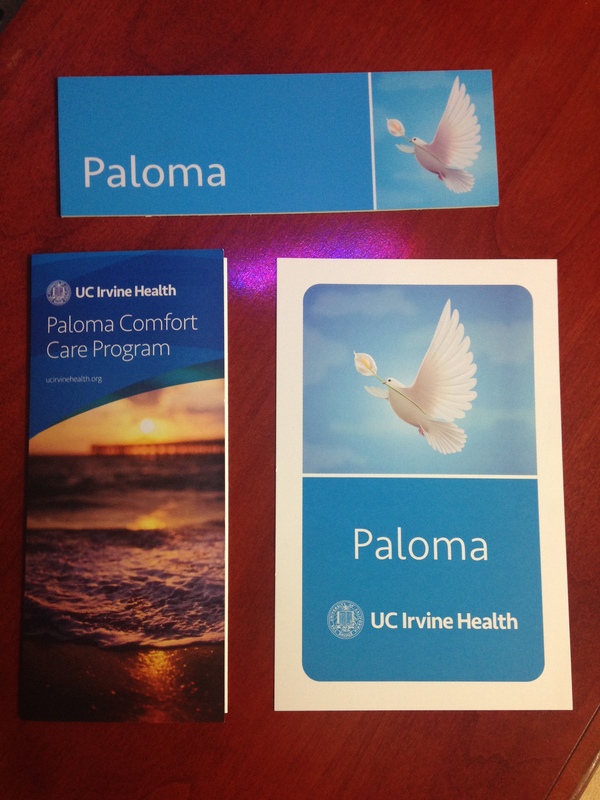 Within six months a framework was in place, and the Paloma Comfort Care program was born. The program helps such families on their journey from pregnancy to birth, and after birth in the Labor and Delivery Unit, Post-Partum Unit or Neonatal Intensive Care Unit (NICU). It promotes a nurturing environment for families by providing emotional, physical and spiritual care. The hospital works with parents in family conferences to understand their needs, hopes and goals for their infant, and to help them make difficult decisions. They are dedicated to family-centered care that honors parental preferences for their baby. The Paloma Comfort Care materials: brochure, plate for the door so medical staff recognizes a patient instantly, and the card families carry so all medical staff know of their circumstance at all times. We are so proud of this partnership between Forever Footprints and UC Irvine Medical Center. The program has already served seven families at the time of diagnosis and thirty-three families within the hospital. The program will continue to grow and expand, and we are honored to be a part of it. While the path of each family will be different, we support families who have to make heartbreaking decisions about their pregnancy and child. These perinatal comfort care programs are needed in every hospital. No family should be alone after the news that their much-wanted baby will die in pregnancy or at birth. We hope to expand our partnerships to every hospital in Orange County and beyond in the coming years. For more information on the Perinatal Comfort Care Program at St. Joseph Hospital, which is supported by Forever Footprints, click here. If you are interested in making a donation to help fund perinatal comfort care programs or you would like to volunteer with our efforts, please contact me at kvonrotz@foreverfootprints.org or Ryan Farnsworth at rfarnsworth@foreverfootprints.org.